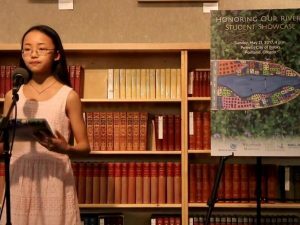 This October marks not only the 50th anniversary of the Wild & Scenic Rivers Act but also a historical marker for Willamette Partnership’s statewide student art and poetry project about rivers, known as Honoring Our Rivers. Like many other 18-year-olds, Honoring Our Rivers is fledging the nest for new horizons. Effective immediately, the project will continue to grow with the Salem-based environmental education nonprofit, Straub Outdoors. 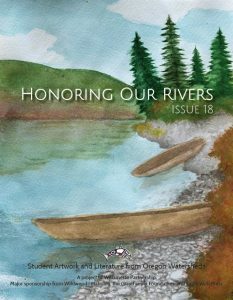 Issue 18 of Honoring Our Rivers includes a feature honoring the tribes of the Pacific Northwest with student and professional works of art and poetry. Honoring Our Rivers is a unique project that gives young people a platform to express their love and concerns for the Pacific Northwest’s rivers and watersheds, which has coalesced nicely over the years with Willamette Partnership’s vision of building a world in which people understand and value the benefits nature provides. As any proud guardian would be, Willamette Partnership is excited to see Honoring Our Rivers continue on its journey with the guidance of Straub Outdoors. Over the last 18 years, Honoring Our Rivers has received over 9,000 submissions of art, poetry, and prose from students (K-college), from over 400 schools. In each publication, the students were published alongside many renown, regional artists and poets, such as Ursula Le Guin, Elizabeth Woody, Paulann Petersen, Terry Tempest Williams, and Brian Doyle. The project is going out with a bang, too. 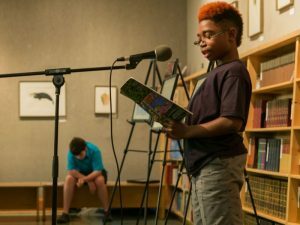 Over 50 fifty students from across the state came to Powell’s City of Books, the world’s largest independent bookstore, in late September to share their work with an audience that spilled into the rows of bookshelves. 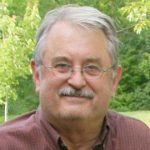 Along with the students, Shoshone-Bannock poet, Ed Edmo, and Portland poet, Jonathan Merritt, read their poems, two of the recent issue’s featured professional poets. Issue 18 of the student anthology features a special section honoring the tribes of the Pacific Northwest to raise awareness and appreciation of Indigenous culture, history, and art. “It was our best Powell’s event yet,” Miller says. 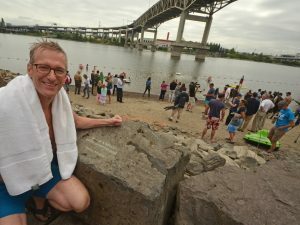 In recent years, Honoring Our Rivers has been a leader advocating for the inclusion of the arts (visual, literary, performing) in Oregon’s environmental education space. Most recently, with funding from the Gray Family Foundation, Honoring Our Rivers released a guidebook to help Outdoor School professionals include more of the arts in their curricula. The project’s major funders include Wildwood | Mahonia, Port of Portland, Clean Water Services, and the Gray Family Foundation. Families, teachers, and students are encouraged to continue submitting to the project—same deadline (Earth Day, April 22, 2019) and same email address (info@honoringourrivers.org). To learn more about this project, visit www.HonoringOurRivers.org. What Can You Learn From Kids Who Love Rivers?